A secondary meta-analysis of programs to reduce falls in the elderly is undertaken to demonstrate a Bayesian analysis. 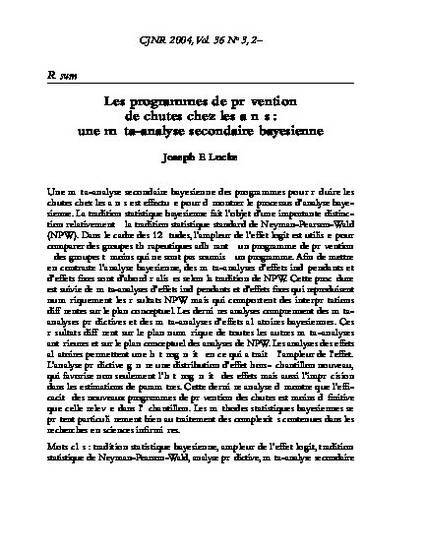 The Bayesian statistical tradition is carefully distinguished from the standard Neyman-Pearson-Wald (NPW) statistical tradition. In the 12 studies, the logit effect	size is used to compare treatment groups using a prevention program to control groups without a program. To contrast the Bayesian analysis, independent-effects and fixed-effect meta-analyses are first conducted in the NPW tradition. This is followed by Bayesian independent-effects	and fixed-effect meta-analyses that numerically replicate the NPW results but have conceptually different interpretations. The final analyses comprise Bayesian random-effects and predictive meta-analyses. These results differ numerically from all the previous meta-analyses and conceptually from the NPW meta-analyses. The random-effects analysis allows for heterogeneity in the effect sizes. The predictive analysis yields the distribution of a new, out-of-sample effect size, which accommodates not only the heterogeneity of the effects but also the imprecision in the parameter estimates. This last analysis shows that the effectiveness of new fall-prevention programs is less definitive than that found in the sample. Bayesian statistical methods are particularly well-suited for the complexities of nursing science studies.